SIZE: 16" x 20" x 1-3/8"
FRAME REQUIRED? Painted on the edges, no frame needed. Visit my art blog to see larger photos of side views; "On My Easel". Painted from memory is this stormy landscape meeting the water. 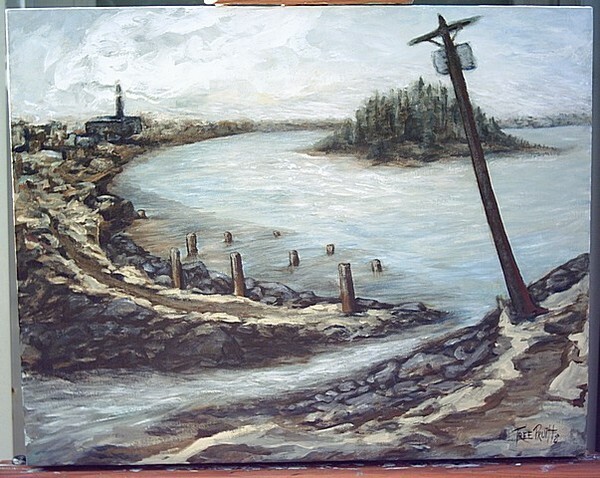 It portrays a walking path along Grays Harbor, literally behind the city of Hoquiam, in Washington State; A compacted version of wild Rennie Island rests in the background. Fantastic landscape.. oh yeah its greaat! Artist Reply: Thank you Reynaldo! It was an enjoyable challenge to paint a scene from memory, so I'm glad the image is enjoyable to view as well. Artist Reply: Thank you very much Armando! I'd often sit in the field while looking at that little island and think of things like Treasure Island and Gulliver's Travels! Oh Darling.. this is wonderful.. i adore your style here!!!! Beautiful work my pic of the day!!!!!!!!!!!!!!!!!!!! !